Do you know which forces drive volcanoes, earthquakes and tsunamis? Are you fascinated by fossils and their evolutionary roots? Have you ever wondered where gold, diamonds and other natural resources come from? Are you concerned about the environmental consequences of the extraction of oil and gas or radioactive materials? Geologists need a good grounding in physics and chemistry, and biology underpins the study of fossils, so if you are considering studying other sciences and would like to see different ways that they can be applied to the world around you (both in the laboratory and through fieldwork), then A Level Geology may be the subject for you. 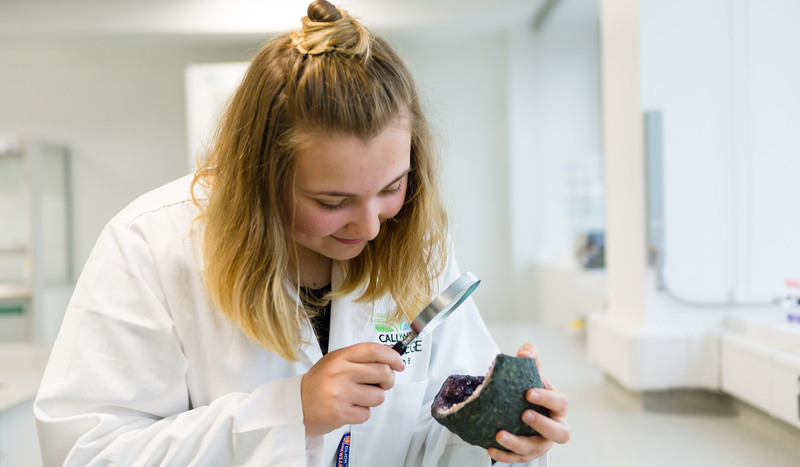 In your first year you will investigate the Earth from its meteorite origins through to the range of rocks found in its different layers and surface environments. You will study the immense forces that circulate rocky material through the inside of the Earth and move the surface plates around, leaving huge cracks and folds behind as evidence of past activity. You will discover how geologists need a multitude of different skills to accurately measure and describe features in the environment. Through field trips in Cornwall, further afield in the UK and even abroad, you will develop these skills for yourself. By the time you reach your second year you will be able to apply your basic knowledge and skills to many geological situations. You will use geological maps and cross sections to investigate the difficulties of finding and extracting resources, from water and gas to oil and metals. You will study how and where to construct dams and reservoirs, analyse and debate the problems of constructing roads, tunnels and coastal defences, and consider the comparative benefits of different sources of power from coal to geothermal sources. In your second year you will also study the evolution of life on Earth and how geologists can use this knowledge to reconstruct a geological timescale stretching back a billion years. The evolution of life has constantly reacted to changes in environment and climate so you will also study the causes and driving forces behind changes in Earth’s climate and the evidence we have for these changes, locked away beneath your feet. All this information is written in the rocks and you will learn how to read them! Students undertaking A level geology are expected to take part in the planned field trip programme to develop field skills and complete assessed coursework required by the OCR examining board. There is a minimum requirement of four days in the field over the 2 Year programme. A 3 day Jurassic Coast trip in October comfortably covers the AS component and provides most of the A2 component as well. This trip is subsidised by the college but requires a student contribution of around £55 to cover B&B in Portland Youth Hostel. The college will organise sufficient day trips around Cornwall to complete any remaining field work requirement, all of which will be fully funded by the college. Other student funded geology trips are organised on an annual basis, sometimes abroad. Additionally, in March, there is a trip to Iceland, run by the geography department, which is also open to geology students if space allows. PLEASE NOTE ­ That any disabled student wishing to take geology can still complete the course. There are plenty of accessible geological outcrops that can be incorporated into the field programme. Please contact the college for a detailed discussion of your needs to allow advance planning to be put in place. 3 written exams, covering all 1st and 2nd year content - component 1 Fundamentals of geology (41%), component 2 Scientific literacy in geology (37%) and component 3 Practical skills in geology (22%). The Practical endorsement (component 4) is not assessed. It is based on the lab and field skills that are developed over the 2 years of the course as is reported separately. You will be expected to undertake at least 4-6 hours of independent study time per week. Throughout the year you will be able to access additional support through drop-in sessions, dedicated revision workshops, tailored to 1-to-1 provision, as well as a variety of additional opportunities to stretch and challenge the most able students. We encourage you to proactively engage with the support available in order to reach your full potential. Designed to lead to Higher Education or into an HE Level Apprenticeship. Geologists are required in the oil industry, mining, materials science, hydrogeology (water resources), civil engineering, geotechnical engineering, public services, geohazard prediction and mitigation, scientific research (e.g. climate change, seismology) and education. Employment prospects are currently good.